Bean leaf beetle (BLB) damage is being reported in scattered areas across the state. Though they are active in all the soybean production areas, the most significant damage seems to be in the central Kentucky counties. 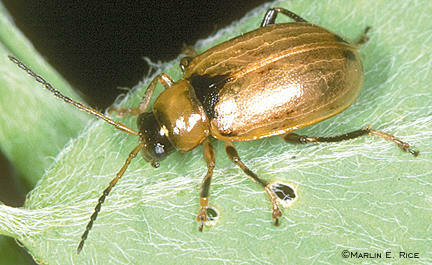 These beetles will be pests from plant emergence throughout the season. They are present in most fields every year. In some years seedlings will be heavily damaged. You should have intensive scouting from emergence through the first trifoliate then from pod set through pod fill. Bean leaf beetle can come in several colors and patterns (See the photos courtesy of Dr. Marlin Rice). However, regardless of whether they have spots or stripes they will always have a backward pointing black triangle just behind the head. Adults are about 1/8” – ¼” long. The body is slightly convex and the beetle is longer than wide. Color is variable, ranging from light brown to dark red, spots and/or stripes may be present or absent. Bean leaf beetles feed on cotyledons, leaves and pods. Leaf feeding consists of very distinctive almost circular holes. Feeding on cotyledons and pods usually appears as scooped-out divots or holes in the surface. Scouting in early season: look for stand reduction (cotyledon stage) and heavy leaf feeding while crossing the fields. If damage is noticed, try to establish that BLB is the problem by looking for them on the plants. Control should be considered if 30% stand loss (cotyledon) –OR- 30% defoliation (true leaves) is present. Early season damage is caused by “overwintering” BLB adults that survived the winter in perennial crops and weeds, then move back into soybean fields. In addition to the feeding they will lay eggs in the soil around plants. These eggs will hatch into small worms which will complete their development in the soil. BLB will have two more adult generations during the soybean season. The 1st generation adults will emerge in midseason and will feed on leaves. We generally do not have problems with this generation. However, economic populations are possible. They will also lay eggs in the soil eventually resulting in the 2nd BLB adults. 2nd generation adults emerge during reproductive or pod filling time and feed on leaves, flowers and pods. This population can be more important than the 1st generation, as these beetles are feeding directly on the yield. When soybeans begn to mature these 2nd generation beetles will move out of soybeans and into surrounding perennials (alfalfa etc.) and weed plants through the fall then overwinter for the following year. It is possible to have a 3rd generation, but that is more likely to occur much further south. I collected two Japanese Beetle (JB) adults on 23 May in Fulton Co. Kentucky (KY); so emergence of this insect has begun. Likely the early season warm weather and very dry conditions, (at least in western KY) will alter the pest’s emergence pattern. 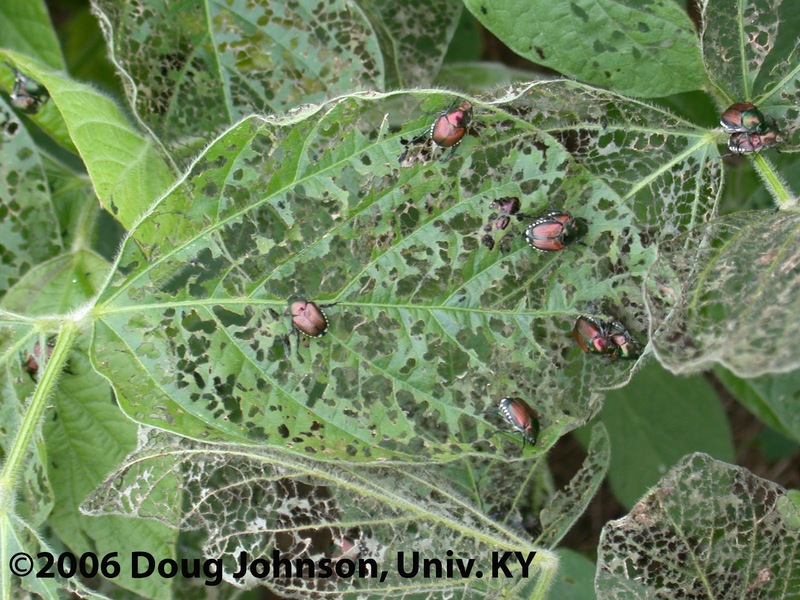 JB is a defoliation pest of both corn and soybeans, and a silk feeding pest in corn. Without question the most important of these tendencies is the corn silk feeding. JB is normally a common insect in KY during the latter half of June. Conversely, we may be seeing populations emerging a bit early because our very warm late winter and spring temperatures. 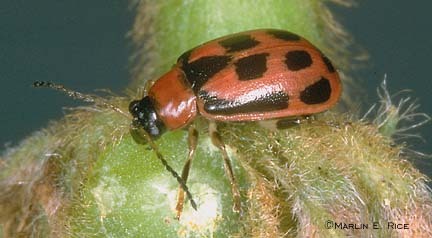 Having said this, the situation in western KY may be quite different because of a particular adaptation of this pest. During dry conditions, JB adults are known to delay their emergence from the soil until there is enough soil moisture to insure the survival of their eggs. So, even though the development of the white grub stages and their change into adult beetles may be early, in dry areas the emergence from the soil of the adults may be delayed in favor of rain fall. This delay could cause concentration of the adult emergence into shorter time period giving the appearance of a larger emergence. JB adults are metallic green and bronze beetles about 1/2“ long. There is a row of white tuffs on each side of the body below the bronze wing covers (Figure-1). They have chewing mouth parts and consume leaf tissue between the leaf veins leaving a lacy appearance. They prefer to feed at the top of the plant and work downward. Their feeding may be dramatic, which leads to the situation where the feeding looks worse than it really is. Nevertheless they can (though not often) reach economically importation levels. In most cases JB appears when most soybeans are in the middle v stages and contain quite a bit of foliage. In this year, particularly in areas where planting will be delayed for lack of moisture, this relationship may be altered. Certainly younger plants will need more attention while JB is present in large numbers. the insect section of IPM-2 KY IPM Manual for Soybeans. In the case that insecticidal control is warranted a list of products labeled for this use may be found in ENT-13 listed above. The CME Group Inc, who oversees corn, soybeans, soft red wheat, and other agricultural commodities futures trading, expanded their trading hours, on Sunday May 20th. The initial reason for the change is because another competing exchange – IntercontinentalExchange Inc. (ICE) recently offered corn, soybeans, and wheat futures contracts with longer trading hours than those found at CME Group. Both the Kansas City Board of Trade and Minneapolis Grain Exchange plan on following the path of ICE and CME Group through additional trading hours. Trading hours for CME Group corn, soybeans, and wheat futures contracts will now encompass 21 hours of the day, up four hours from the traditional 17 hours. The four hour expansion impacts only electronic trading, not open outcry trading. Electronic trading will begin at 5 PM and run through 2 PM the following day, Sunday through Friday, Central time. Open outcry will keep their traditional hours from 9:30 AM to 1:15 PM, Monday through Friday, Central time. Trading will be closed for three hours from 2 PM to 5 PM. Does electronic vs. open outcry trading matter? According to data from the CME Group, 93% of all trading volume for 2011 was conducted through electronic trading. The current trend has been to have more trades taking place electronically rather than open outcry. Concern will come when the first technical glitch takes place – Facebook's initial public offering caused a huge technical glitch on NASDAQ, which caused millions of orders to not be placed. The market was active but traders were unable to enter or exit positions. Electronic trading on futures exchanges will need to be prepared for massive spikes in volume, especially after the release of USDA reports. ICE is now offering corn, soybeans, and wheat futures contracts, see: https://www.theice.com/us_grains.jhtml. The ICE corn futures contracts have been trading roughly 60 contracts per day since its start on Monday May 14th. In comparison, the CME Group corn futures trades roughly around 300,000 contracts per day. Both CME Group and ICE are competing for traders over futures contracts offered at their exchange and contract specifications. However, ICE has a steep hill in front of them before they take over corn, soybeans, and wheat futures trading. Electronic trading will take place through the release of important USDA reports such as monthly supply and demand and plantings reports. Initial reactions to USDA reports will flow immediately into prices where traditionally these reactions had to wait until markets opened. The possibility exists, though unlikely, where the USDA could move the release time of their reports. Futures contracts are evolutionary - constantly changing and adapting. Last year the CME Group expanded daily price limits for agricultural commodities and a couple of years ago they changed delivery specifications in the wheat futures contract. Continue to expect further changes to rules and regulations associated with futures markets. When does soil get too dry for young corn? Young corn seedlings require very little water. When does soil get too dry for young corn? Or, when will you know that the young corn seedlings will not make it? Variations of these questions have been coming in as the lack of rain continues and the temperatures rise on young corn plants. The quickest, and perhaps most practical answer, is to scout fields regularly and identify areas where plants are not recovering from drought stress. In other words, the best indicator of when the plants will not make it is when they have died. A more technical answer is that a soil gets too dry when the ‘permanent wilting point’ is reached - the level of soil moisture at which plants will fail to recover(Taylor and Ashcroft, 1972, Physical Edaphology: Physics of Irrigated and Non-Irrigated Soils, Freeman and Co., San Francisco). Most plants will display drought symptoms long before the permanent wilting point is reached. Most silt loam soils will reach the permanent wilting point around 8% moisture content (weight/weight), while a clay loam will reach the permanent wilting point around 10% moisture content (weight/weight).The permanent wilting point varies with temperature, compaction/structure/pore arrangement, and the resulting ability of the soil to conduct water. With soil conditions dry in the upper 3 to 4 inches in many fields, farmers are tempted to place soybean seeds deeper in search of moisture. In general, soybeans should be placed about 1 to 1.5 inches deep and no deeper than 2 inches in dry conditions. The more ideal situation would be to wait for a rain and then plant 1 to 1.5 inches deep. However, many growers believe they cannot wait for the ideal situation because of the total number of acres they need to cover. Soil type and soil condition influences soybean planting depth. The following are our general guidelines for soil conditions and soybean seed placement. Dry, silt loam soils (the majority of our fields at this time) should have soybeans placed no deeper than 2 inches, even if soil moisture is deeper. When planting in sandy soils (very few of those in Kentucky), soybeans should be placed about 2 inches deep. Heavy clay soils require soybeans to be planted about 1 to 1.5 inches deep. Cool, wet soils (not many of those at this time) cause slower germination and soybeans can be placed about 1 inch deep. For more information on this, see: Soybean Planting in Kentucky. Bill Bruening, our Small Grain Variety Testing coordinator, visited all of his sites on Monday and Tuesday this week. The following are his comments from around the state. With the exception of Logan County, there was less freeze damage than I expected. I found it difficult to make freeze damage ratings because the damaged "empty" heads were green/yellowish; but these often blended in with other healthier heads. The heads were not whitish at all, as had been expected. During the Easter hard freeze a few years ago, heads that were emerging from the boot turned white. This 2012 crop was much further along and the freeze was not as hard. Heads that were emerging from boot this time appear to be fine. The damage was on those heads fully emerged from the boot. A lot of heads also had partial damage (perhaps related to flowering location on the head at the time of freeze). I took disease ratings there in Logan County (for Septoria and BYDV) but there was no other disease pressure. The barley appeared to be less damaged and looks to be three weeks from harvest. A lot of corn is germinating and emerging across the state and these young seedlings find themselves in dry soil conditions. The Weekly Crop and Weather Report, released on April 30, 2012 documented that 56% of the corn crop had emerged. In addition, about 40% of the topsoil was short to very short on moisture. Corn at the seedling stage does not require much water. Nebraska's Irrigation Management for Corn states that emerged seedlings (VE growth stage) use about 0.08 inches of water per day. Corn at the 4-leaf stage uses about 0.10 inches per day. The upper six inches or so of the soil is where the critical water is being held for these young seedlings. Fields that received tillage (even the minimal "vertical till" systems) are drying out faster in the seeding depth area than fields that are in no-tillage. If we do not receive rain for an extended period, then the tilled fields are most likely to see water stress problems first. Even if conditions get dry enough to hinder seedling growth, yield losses typically will not be more than 20% on water stress before tasseling, according to Arkansas' Corn Production Handbook.